Apple at its Tuesday education event, introduced a slew of new education apps, which includes: Classroom for Mac, Schoolwork, and the Everyone Can Create curriculum. While Apple hope to strengthen its classroom presence with the Everyone Can Create curriculum and Schoolwork apps, now joining Classroom to round out the iPad school suite. The new iPad with Apple Pencil support perhaps attracted all of the attentions, as Apple used the education event in Chicago to unveil a host of new tools for teachers and students, aimed to make the most of their Apple education experience. Also, Apple has expanded the Classroom application, now including the Everyone Can Create curriculum and Schoolwork app. Find below what the different tools can do and how schools can utilize them. Apple soon to be released Classroom for Mac, which will be available this June as a beta, like the original Classroom app, can be used to launch apps, books, and webpages on Mac by the students and Teachers. It integrates into Apple’s Schoolwork app, which also received an update, to allow the teachers to take students to a specific point within the app, or assign specific tasks within another app. Everyone Can Create Curriculum presents a free resource to teachers and students for the integration of videos, photos, illustrations, and music into lessons or assignments. It is developed in-house by Apple with input from educators, and will be available in the Spring, with lessons already available at Apple sessions in the Apple Store. As part of the Everyone Can Code project, the teachers can create interactive lessons, while students can work on the active projects. 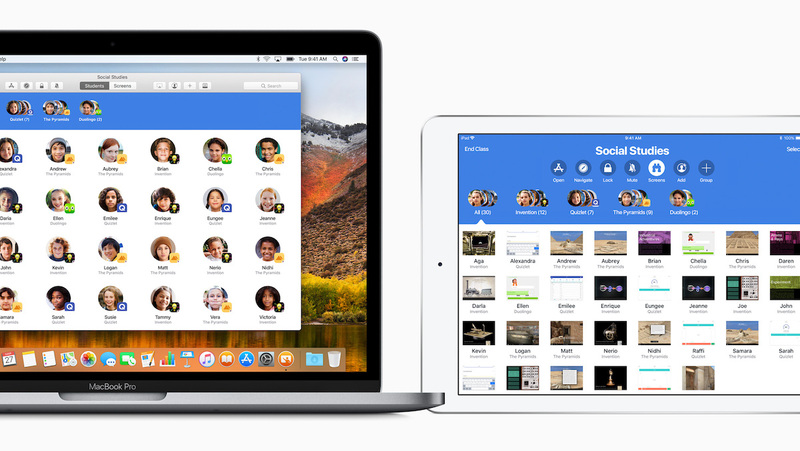 Apple says it's Schoolwork Management suit is a better solution to the competitions, with many of them web-based programs, and having serious shortcomings. There are a variety of classroom management applications, which is currently available for Teachers. The major difference between Schoolwork and other apps, is that Schoolwork can work with other apps on the iPad that have implemented the ClassKit API. Schoolwork integrates into Apple’s existing Classroom app, and allow teachers to manage and create class assignments and monitor student progress. This integration allow teachers to access a lot of student data at once. However, it remains to be seen whether these apps would work with cybersecurity or privacy tools like Mac VPN software.